Pepper spray may seem like a fool-proof self-defense method that anyone could properly use in any situation, but like any piece of equipment, there is a wrong way and a right way to use it. If you are unfamiliar with your pepper spray you are reducing your odds of being able to properly deploy it in a high-stress situation. If it is used improperly you may not be able to properly disable your attacker, and you may even end up on the receiving end of your own weapon. 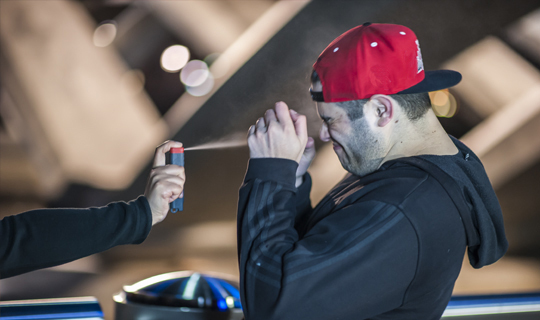 Here are some tips for how to properly defend yourself with pepper spray. Familiarize yourself with your spray. Memorize the feel of the bottle and the safety so that you can quickly arm and aim your spray without looking at it. Know what type of spray you have, is it a liquid, a fog, or a foam. If you have a liquid spray your aim should be side to side across your attacker’s face, if it’s a fog your aim should be up and down, if it’s a foam your aim should be in a circular pattern across their face. Have the proper grip. Do not hold your canister with your index finger in the button, this is a weak grip. Hold your canister with your thumb on the button, this gives you a stronger grip and allows you to punch your attacker if necessary. Keep your weak arm out in front of you while aiming and spraying. This will help you to keep your attacker from closing the distance on you and taking your weapon. If your attacker does try to rush you, don’t back up, sidestep them while you push with your forward arm. Check for multiple attackers after spraying your first threat. Pepper spray can be an effective self-defense tool if used properly, but it won’t help you simply to carry it. Practice with every tool you have for survival and self-defense, it could mean your life.